What could have been! 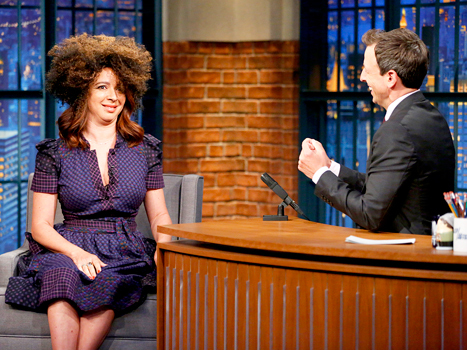 Maya Rudolph moved on from Saturday Night Live years ago, but longtime cohort Seth Meyers cajoled her to create a brand-new impression on Late Night on Monday, June 22. The Bridesmaids star, 42, caught up with Meyers, 41, ahead of the premiere of her IFC miniseries The Spoils Before Dying. The former costars got to chatting about current events, and Meyers mentioned Rachel Dolezal and the similarities in appearance that the headline-making NAACP leader shares with Rudolph. "I&apos;ve been getting that thing kind of on a daily basis with Rachel Dolezal," Rudolph explained of fans telling her she should return to SNL to play Dolezal. "I remember Tina [Fey] saying when Sarah Palin was happening, everyone kept saying, her doorman&apos;s like, &apos;You gotta be Sarah Palin!&apos; But it happens to me every day, people are like, &apos;Oh, it&apos;s too bad, you haven&apos;t been on SNL since 2007. You have to play this lady.&apos;"
The Grown Ups star then did just that, accepting an offer from Meyers to use his show to debut her Dolezal impression. Rudolph grabbed a wig from behind her chair, plopping the curls on top of her long locks. She and Meyers then imitated an interview that Dolezal gave to a local Spokane ABC affiliate when the scandal first broke, in which she dodges questions about her ethnicity and the backgrounds of her parents. 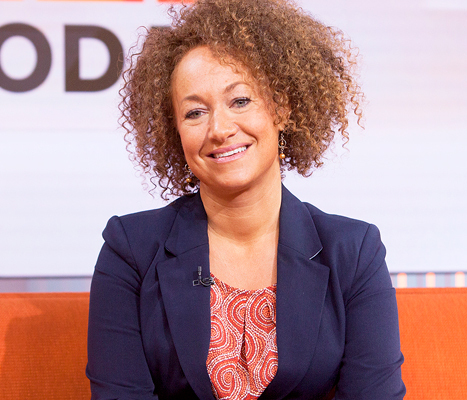 "I think America really missed out," Rudolph said when she wrapped her stint as Dolezal. "I&apos;m so glad I brought my Rachel Dolezal wig. I always keep it in my purse."